Gray tones and geometric patterns aren’t the only things to look for this year. Discover what sorts of flooring choices, kitchen layouts, furniture styles and lighting devices are leading the way. Gray tones remain a favorite neutral, furniture styles are easy to live with, lightweight window treatments are back and options have never been wider for practical but beautiful flooring in 2016 home interiors. Button-back sofas and mixed-finish surfaces are favorites, too. We don’t jump into any old fad around here. We’re sensible Midwesterners and we’re happy to allow coastal folk to sift through home fashion trends before we adopt the best ones a few years later. Still, we enjoy coming home to comfortable, stylish rooms as much as anyone. Here, NWQ checks in with local retailers to learn which trends are finding their way into homes of the Old Northwest Territory. Gray, gray and more gray. It became the neutral color of choice a few years ago and isn’t disappearing anytime soon. Shades of gray are showing up on cabinets, furniture, walls, textiles and floors everywhere you look. Gray plays nicely with most accent colors, from bright lime green or hot pink to earthy creams and taupes or pops of yellow and shiny gold. Gray extends to the bedroom, in wood finish tones ranging from light driftwood to steely dark. Sometimes the gray is picked up in upholstered headboards. Walk through a showroom and you’ll see that distressed wood finishes dominate. Today’s consumers don’t want to fret about the scratches and dings that come with everyday living. “The reclaimed/restored, weathered, ‘found object’ look is prevalent,” says Carlson. “And yet you’ll see a room with distressed furniture topped off with a contrasting bit of glitz – a crystal chandelier, for example, or a gold wall ornament. It’s almost shabby chic. It’s eclectic. We find a lot of interesting detail in today’s furniture, but it isn’t fussy,” says Carlson. As a general rule, think “authenticity” when evaluating your home’s surfaces. Faux finishes are out; natural materials inspired by nature, like unvarnished wood and stone, reign. Yet in fabric designs, florals remain passe; ikat, geometric and circle prints prevail, along with colorful Suzani patterns inspired by tribal embroidery work found in Central Asia. “Designers travel the world looking for inspiration, so we’re seeing global influences from India, the Mediterranean, Morocco,” says Johnson. Another prevailing theme is softness. On windows, this means no more stark-naked panes. Window treatments that soften the look of a room are back, although they’re not the heavy, light-blocking dust catchers we saw a decade ago. Simple shades, sheers or panels that allow light to pour into a room, but can be pulled shut for privacy, are the way to go. Flooring, too, is trending toward easy-to-live-with materials. But make no mistake: flooring must also be beautiful. After all, it covers a good deal of surface area in a home and ties rooms together. Not to be confused with the plastic-looking vinyl floors of yesterday, luxury vinyl imitates natural wood and stone products with uncanny accuracy. The image on the surface of the vinyl is topped with a highly durable finish that resists stains, scratches and dents. Vinyl products are softer and warmer underfoot than real stone or tile and far easier to install. The variety of patterns and colors make luxury vinyl a dream material for designers, and gray is well represented in both wood- and stone-look varieties. Trending now are much wider planks and much larger tile sizes. “In bathrooms, where floors encounter so much moisture, luxury vinyl and porcelain or ceramic tiles make the most sense, look beautiful and are very popular,” says Rose. Hard-surface flooring continues to gain ground over carpet. Luxury vinyl is taking market share away from laminate flooring, but solid wood and engineered wood floors are still wildly popular. As with furniture, casual, distressed styles of wood flooring are preferred over perfect shiny finishes because they disguise flaws that come with wear. While fewer square feet of our homes are covered with carpet these days, it’s still highly valued in certain rooms for its warmth, softness and beauty, especially in cold-weather climates like ours. Extremely soft fibers make carpet more pleasant to touch than ever before, as touted in brand names like Shaw’s Caress line and Mohawk’s SmartStrand Silk. Easy-care features are vastly improved from years past. “You can now buy a carpet pad that’s 100 percent waterproof on the surface,” says Rose. “So if your dog has an accident, that fluid is not going to seep down into the pad where it’s impossible to clean.” Some newer carpet fibers are filled with a clear substance that makes it impossible for them to absorb stains. 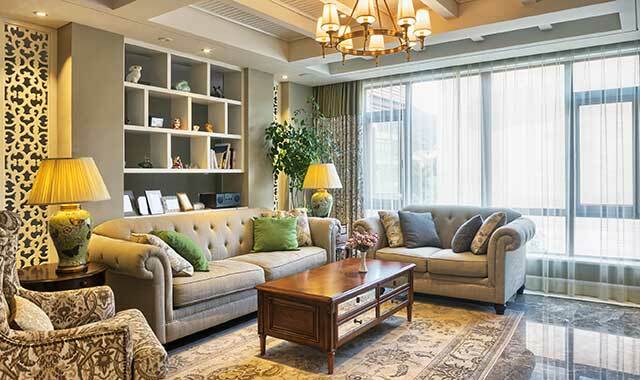 The durability of carpet varies greatly and “you really do get what you pay for” when it comes to choosing a carpet of good fiber with adequate face weight, density and twist, says Rose. You get what you pay for when it comes to furniture, too, and Johnson at Gustafson’s sees a growing demand for better-made furniture. “Both across the U.S. and here in our region, people are tired of cheap furniture that falls apart,” he says. Gustafson’s prides itself on offering items at every price point, and has expanded higher-end lines like Bassett and Flexsteel, as well as Daniel’s Amish, to meet growing demand for high-quality furniture. People want better furniture, but not necessarily bigger furniture, says Johnson. Leather still reigns supreme; not surprisingly, there are many gray leather sofas on showroom floors. Be sure to ask questions about leather quality, since there are many imitations on the market. Protected leather is your best bet if pets will be on your furniture, says Carlson. Unprotected leather has a supple feel, like an old bomber jacket, but will scratch easily. Ordering custom sofas is easy these days, although you may have as many as 900 fabric options to decide among. Most of today’s upholstery fabrics are made from PET, a highly durable polyester thread, says Johnson. Transitional styles are more popular in our region than strictly contemporary or traditional, but the bottom line is comfort. While most of us are gravitating toward informal styles, we’re punctuating them with bits of glitz and glamour, as evidenced by the elegant tufted button-back sofas and chairs now sprinkled throughout showroom floors. They’re often made in velvety, saturated jewel tones that say “luxury” in the same way that sparkling chandeliers do. Although big entertainment centers went the way of the dinosaur when giant flat-screen TVs emerged, some are appearing again in updated wall units. Feuillerat has designed several custom-built wall units recently. “We’ve also been doing custom beverage stations, bars, laundry rooms and libraries,” she adds. When buying upholstered furniture, the important question is not just how the surface looks but what lies beneath. Do business with people who are knowledgeable and in it for the long haul, not fly-by-night chain stores with high staff turnover. The better stores want your repeat business. “They have a real stake in making you happy and will deal with you more honestly,” notes Johnson. Carlson adds that a reputable store often has a cut-away model that shows you the materials below the surface. But function is important, too. The emphasis is on quality construction and thoughtful, not flashy, details. “Things like inlaid wood, little metal pulls or latches, a clever combination of painted and traditional wood tones – these details are what make new bedrooms look so appealing and fresh,” says Carlson. As with living room furniture, the scale of bedroom pieces is no longer enormous. “As in the rest of the home, people want very easy-to-live-with furnishings, which means distressed wood finishes, but they also want to feel their bedroom is a retreat, a place to be a little pampered,” says Carlson. A great bedroom is, first of all, conducive to good sleep, and there’s never been a wider selection of mattresses. This can make the buying process confusing. Foam and gel technology mattresses are popular, as are combinations of coil and foam. Johnson sees a demand for adjustable bed platforms across all age groups. “Millennials like to sit up in bed and work on laptops, etc., and older people have always valued adjustable beds,” he explains. Underfoot, all flooring types are suitable for the bedroom but carpet is often preferred. “When you climb out of bed on a cold morning, that soft carpet feels awfully good,” says Rose. Gone is the trend of converting dining rooms to media rooms or offices. Families are gathering around the table again with friends and relatives. But their No. 1 favorite gathering spot remains the kitchen. “I’m taking out a lot of kitchen peninsulas and replacing them with islands for better traffic flow,” says Feuillerat. “This tends to make two spaces come together like one big room, rather than dividing the room in half.” Often an island accommodates seating, giving spectators a place to park and chat with the cook. White cabinets are always classic; very dark wood cabinets are all the rage right now, as are some painted finishes, including, of course, gray. Nationally, designers are incorporating mixed tones into cabinetry to break up the solid mass look, and are even replacing top cabinets with open shelving as seen in old farmhouses – a concept that may be more romantic than practical. They’re continuing to contrast island colors with cabinet colors, too. Hardware is dominated by brushed nickel, but oil-rubbed bronze is making a comeback. As for countertop surfaces, “Quartz and granite remain very popular,” says Feuillerat. Quartz counters are man-made from ground quartz combined with resins. “The newer quartz products have more variety and movement in them than ever before,” she says. They’re less porous than stone, highly durable and don’t need to be sealed. Still, stone counters like granite are one-of-a-kind wonders designed entirely by nature. On backsplashes, ceramic and glass tile are popular. People continue to oust their kitchen desks in favor of more storage space or a beverage station, with or without a sink and mini refrigerator. This allows guests easy access to drinks without getting underfoot of the cook, a big plus when entertaining. Things are changing in the appliance world, too. Although stainless steel finishes still dominate, there’s a growing demand for black metal finishes. A good under-cabinet lighting system contributes much to form and function in the kitchen. Lighting a home well is very important, and there are many more options than most people realize, says Michael McGinty, lighting gallery manager at Benson Stone. Whereas big-box stores “provide basic light cheaply,” Benson Stone provides a world of options at all price points, says McGinty. Advances in lighting technology mean more options at lower energy costs. The world of home interiors is an ever-changing and exciting one as both form and function evolve. Our local retailers are on top of the trends. Browsing their showrooms will spark new ideas for making your home a retreat that’s as efficient and comfortable as it is stylish and beautiful. This entry was posted on Wednesday, March 2nd, 2016 at 12:00 pm	and is filed under Home & Garden, Top Posts. You can follow any responses to this entry through the RSS 2.0 feed. Both comments and pings are currently closed.